Former Arab league Secretary-General Amr Moussa spoke out in a recent interview about Qatar “paying” to have U.S. military presence on its lands in return for protection, said a London-based Arab newspaper. Moussa said that Qatar’s Prince Hamad Bin Khalifa told the United States he was going to fulfill all their military expenses in Qatar if they agree to establish bases in the Gulf state, according to an interview with Al-Hayat newspaper. 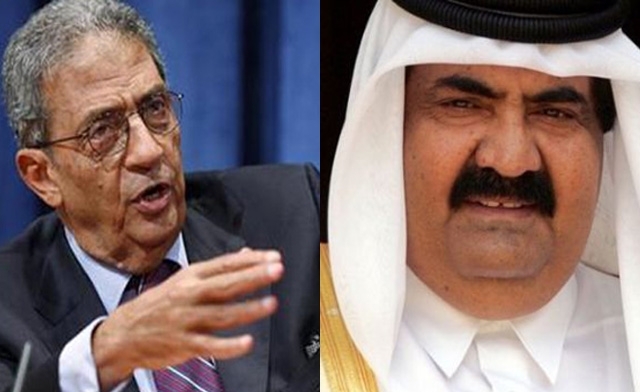 “Sheikh Hamad Bin Khalifa is Qatar’s real power and Sheikh Hamad Bin Jassim assists him. The prince managed the country’s affairs well and took crucial decisions very easily,” Moussa said. “When he thought of protection and saw that Americans are the only ones willing to provide it, here he thought of the American military, which forming a base in Qatar was not among its priorities. But Sheikh Hamad told Americans that he will ensure their expenses are paid in full, so now he enjoys security and has moved forward,” he added. Qatar, the major oil and gas producer Gulf-state, hosts the largest American military base in the Arab region. There are several factors that make Qatar strong, including its leaders’ good management of the country’s domestic affairs, said Moussa. The 21st century, in Moussa’s opinion, does not only rely on countries with traditional powers or states with large land area, but countries willing to make use of modern world media and technological powers. “Qatar became extremely strong because it owns their ‘soft tools’ unlike other countries,” he added. In addition to its small land size and little domestic challenges, Moussa said that Qatar enjoys political stability since “people are financially comfortable, and as long as people are comfortable there are no reasons to revolt” against the current rulers. During the interview, Moussa also spoke about various topics concerning the Arab region, including Qatar’s political role towards revolutions in the Arab world.